Peninsula Malaysia is home to the mainland Asian elephant (Maximus elephas indicus), and Royal Belum is one of their home. After below par performance in Kg Beng, Perak. Our journey continues further north of Lenggong. A visit to Royal Belum State Park, Perak. Post monsoon season, the water level within the next few month will be very high and gradually going down until November. 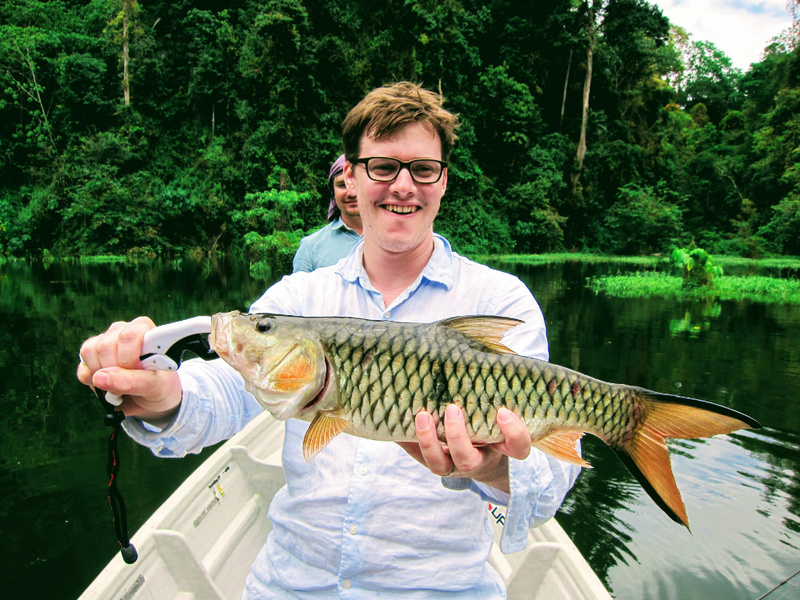 Personally it is one of the best season to come down to Royal Belum for some good fishing. Some people hates it when the water level is high. For me, what ever the water level is, we can still find the right tactics to get the best fishing experience out of different season. At first we were schedule to stay at the Nan House Boat, but Daniel and Mitch decided to stay at the Royal Belum Rainforest resort instead. It does get a bit loud at night, especially when a houseboat getting ready to set sail the next day haha. Apologize for any inconvenience but we look forward to have great outing tomorrow. After evaluating Mitch and Daniel performance in Kg Beng, both of them are good anglers and hopefully they can capitalize a good outing when they are out here. Its all about having balls to actually place lures in places where we can lose our lures easily. Losing a lure should always become a secondary matter as we want to increase our bite rate. As for Day 1, we head straight to Sungai Kenarong, Royal Belum. It is a special place and one of my favorite fishing spot. The long river pathway Sungai Kenarong is suitable for trolling and the grassy river banks that are now underwater thanks to the increase of water level is home to the Giant Snakehead. 2 Species, one location. Mitch finally breaking his 2 day fish-less fishing streak. Me and my boatman Pokjan, pick-up Daniel and Mitch at the Belum Rainforest Resort and head straight towards Royal Belum check-point. As usual, we make a left turn to Y-Bay for our warm-up session. 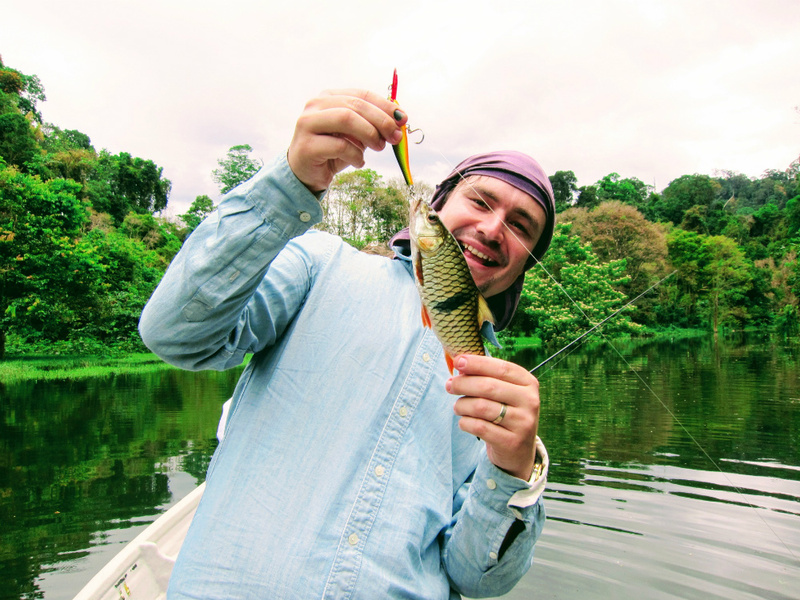 Only during this season, top water lure is an effective method to lure in Sebarau and Giant Snakehead. Blade and Spoon works well when we want to scout deeper area. Upon trying spoons and blade, Mitch scored his first fish of the trip. Breaking his 2 day fish-less fishing streak. A small Sebarau and a Malayan Leaf Fish or Pepatung. Unusual for a Malayan Leaf Fish to chase after blade lure, but today is an exception for this particular species. Both released safely. We bid farewell to Y-Bay and adjust our course to Sungai Kenarong or Kenarong River. 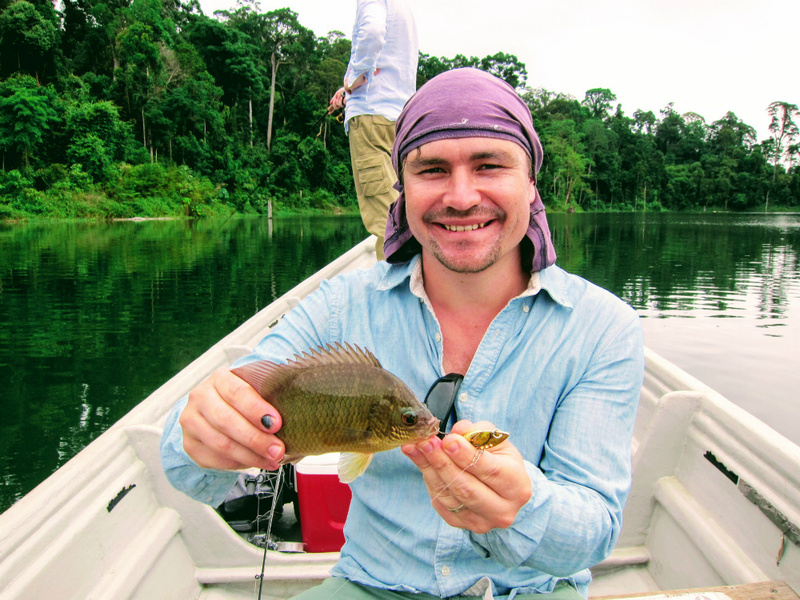 Malayan Leaf Fish or scientifically known as Pristolepis fasciata not now to take blade lure except for this one. 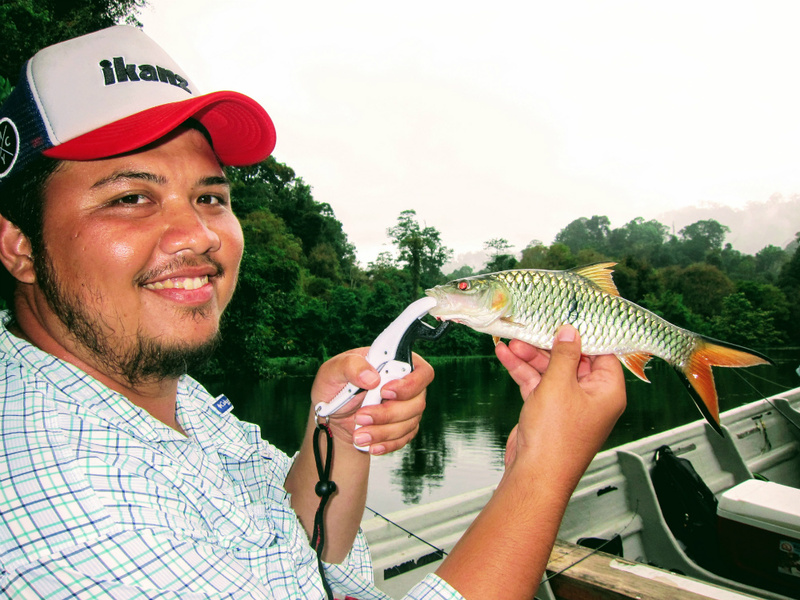 Trolling inside Sungai Kenarong will be very interesting as it is home to large Sebarau and Giant Snakehead. Caught one of my personal best here and hopefully this two guys will taste its sheer strength on a very light tackle. A diving lure about 4m is enough. I had Daniel running a Rapala Risto Rap 7 PRT and Mitch on a Rapala Minnow Rap 7 BHO. It was Daniel Risto’s sets off on first run. It hit like a fright train, even for a small size Sebarau. To honest, I am a bit worried on the setup. Both of them on a very small reel and line rating (12lb). If something big decided to take the lure, it could be a one way ticket haha. 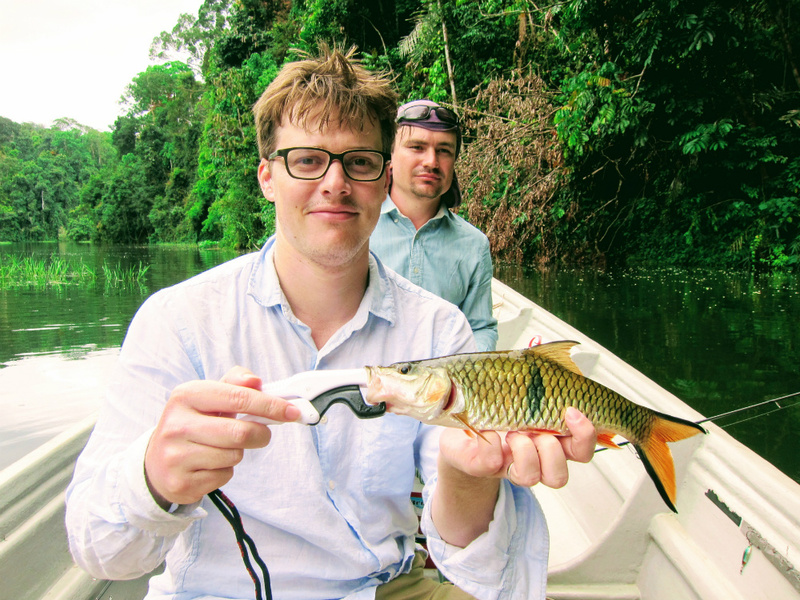 A quick photo with the fish and we continue our journey further upstream into Sungai Kenarong. As we hit a the first bend, Daniel Risto Rap sets off and this time was not the usual 30cm Sebarau. Our first trolling session, hooked a small Sebarau as we venture deeper into Kenarong. 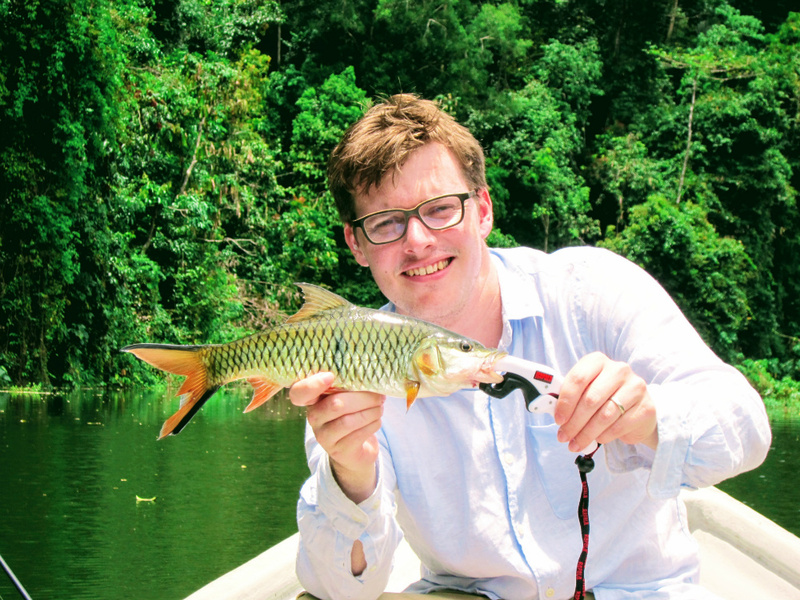 It was a test for Daniel, as he need to avoid the fish from snagging itself into the sunken grass area. It was not easy but he did it nice and easy. The rods and line hold on through out the battle and finally a good 50cm++ Sebarau landed! It was awesome! Felt really good and to his time Daniel keep his head cool and bagged this one. Its been a while since we last saw a 50cm++ size Sebarau, a well deserve trophy for Daniel. Ecstatic! A great way to start the day with a 50cm++ Sebarau onboard. 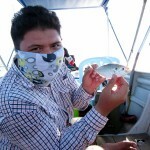 Rapala Risto Rap 7 is one of the best lure to be used here in Royal Belum. We continue to troll but nothing hammered our lures. We backtrack and continue to troll downstream but it was quite way down to our initial trolling point. Based on my experience, we had more success hits when we trolling towards upstream. It was quite, right about the river bend. BOOM! 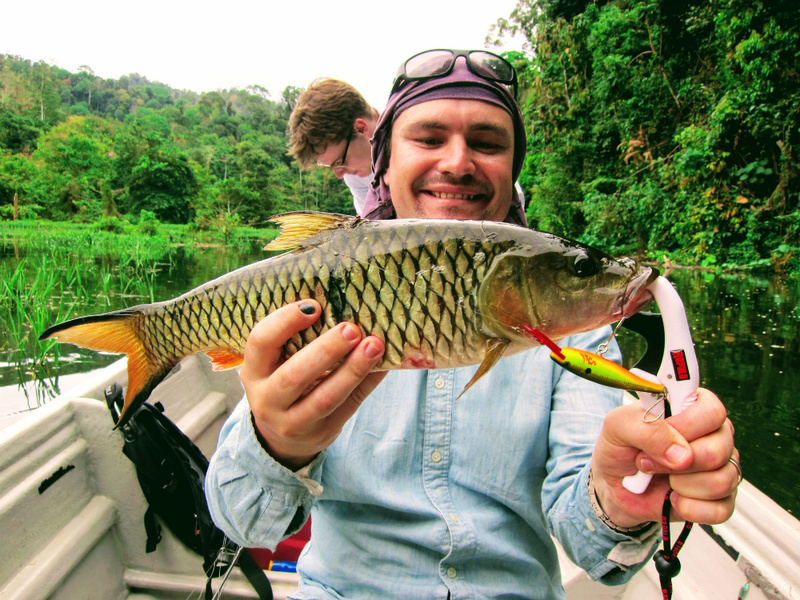 This time, Mitch got his Minnow Rap hammered by another Sebarau! I can see the line streaking towards heavy cover as the fish find its way to ditch the lure. Soon, Mitch bagged his 45cm++ Sebarau. What a way to start the day! Competitiveness between the two was very high and it seems Daniel’s Sebarau was the biggest. Haha. For me, good to know two of my favorite lure still is the best choice in this part of the river. As we stop, Mitch cast towards the strike zone and find himself hooking a small Sebarau. Trolling for more fun, left hand side is the main river, right hand side is actually a river bank. Last one before we head to Sungai Kenarong Base Camp for our lunch break. It was already time for lunch and we travel back towards Sungai Kenarong Base Camp. It was getting dark and it rained late in the afternoon, just like in Kg Beng. 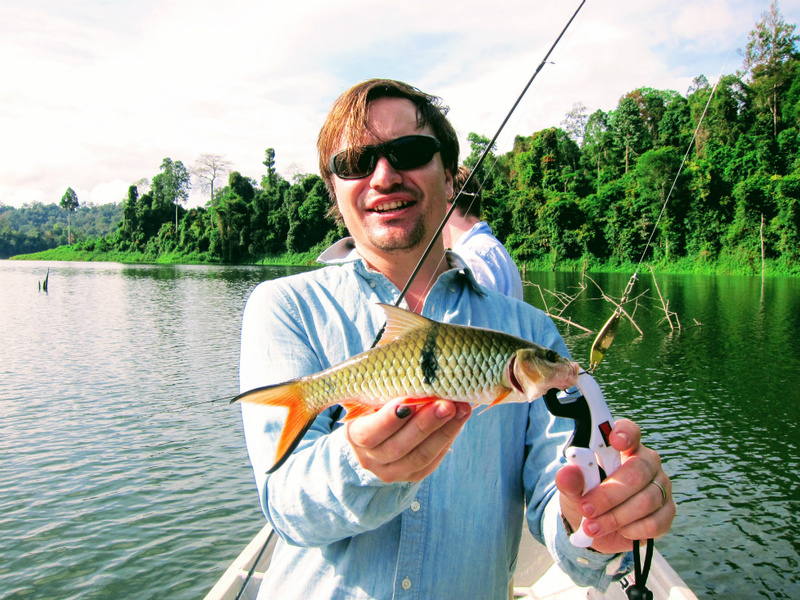 Fishing in Royal Belum usually gets better after the rain. 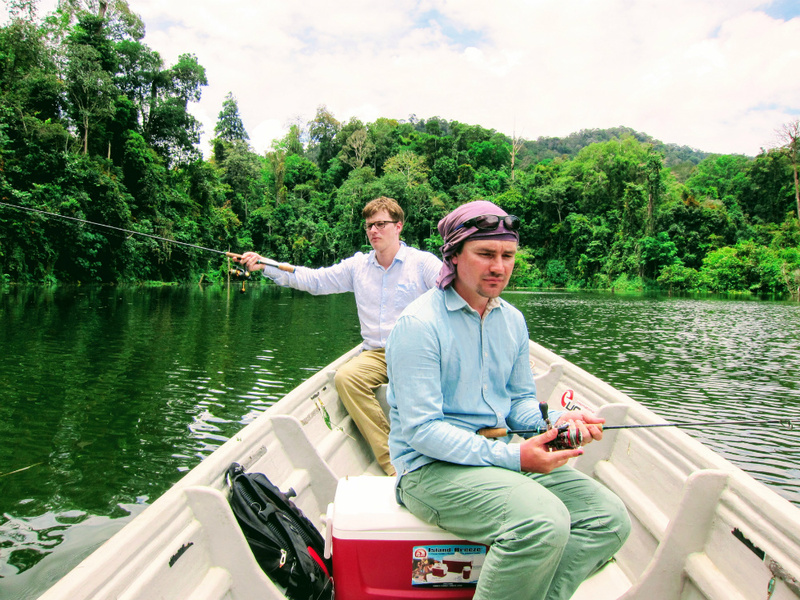 The plan is to hunt down Giant Snakeheads of the banks of Sungai Kenarong. It can be tough as those area is covered with underwater grass, a safe haven for them. I simple and quick lunch is on the menu. 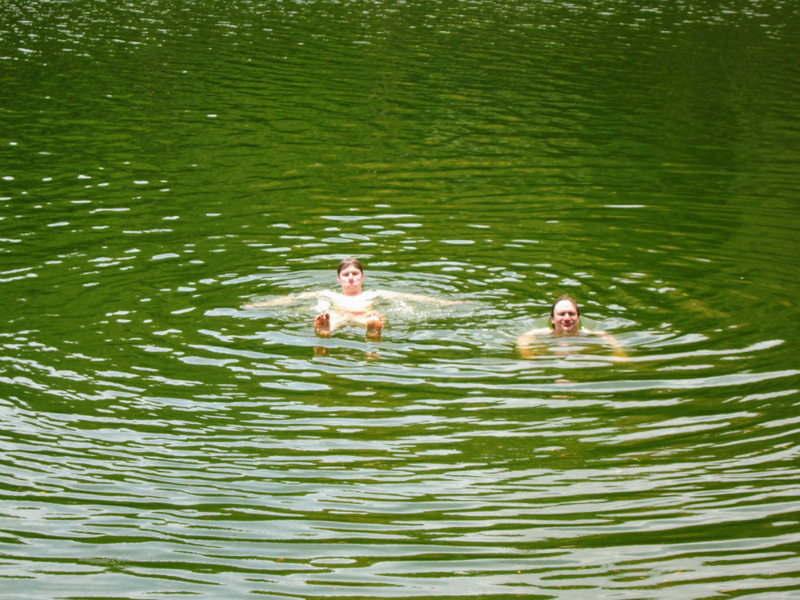 Mitch and Daniel decided to go for a swim, just off the boat pontoon. A quick dip, to kill off the heat from the sun. Don't go too far now, Toman might catch you lol. Fishing session continues in the afternoon. It was rained when we get to the fishing spot. We did a little bit of trolling but no fish took our lure. 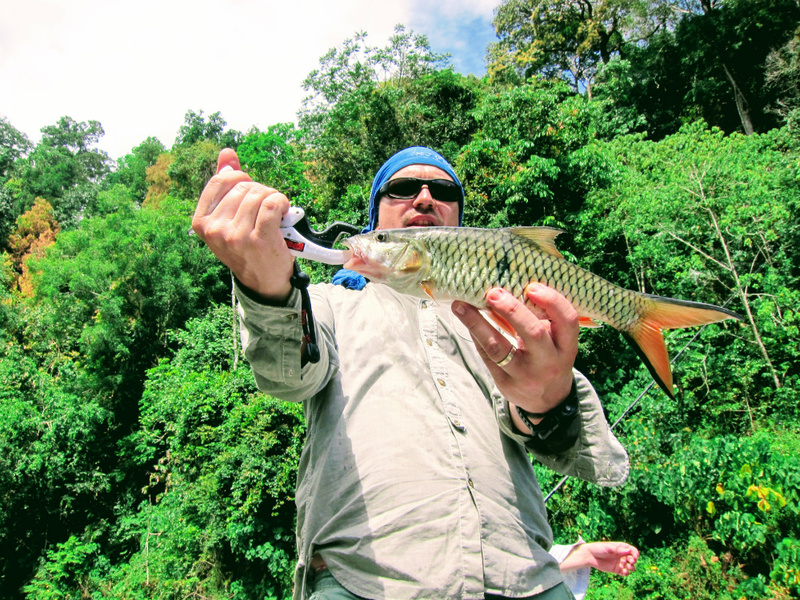 Its time to use some jump-frogs and buzzbait to fancy ourselves hooking a Giant Snakehead. Blind cast towards grassy area, hoping for Giant Snakehead to come out and ambush our lure. Hooking one is another matter and landing one is the toughest challenge. I got but buzzbait as far as as I can so that I can scout more area. Looking for a clear pathway in between the weeds and grass, and that loud buzzing sound will trigger a Giant Snakehead attack. As I was continue on casting and retrieving my buzzbait, finally I got 1 solid hookup! Out of no where, a Giant Snakehead decided to hammered the buzzbait. I was ready a full drag and quite a tough rod. I know that I had a good chance if I can pull it out from the grassy area. It easier in my head then to get it actually done in real life. The fish still stripping line from my reel and the worst thing finally happened, it snagged itself. Buried deep in its bunker. Pokjan tried to get it out of the weed but it was nothing that can be done. We can clearly see its large tail sticking out about 1 meter from the water. It is still deep and Im not risking anyone to go down there to take it up. The only thing that I can do was to really pull it hard and the line snap. It was a good battle, gutted that I lost that one but still a good show for the guys. After retying the leader, missed another Giant Snakehead strike. It was not meant to be. We stayed on until late afternoon and decided to go back home. Still another day tomorrow and hopefully we can get that Giant Snakehead. Cute Sebarau, just before the rain. Background is where the grassy area is. Final day was focused on getting a Giant Snakehead off the bucket list. It is easier said than done. We still heads towards Kenarong River, hoping to repeat last night feat. It was all to quite. Mitch scored a lonely Sebarau. We targeted Toman fry, to get the parents on defense mode and hammered our crank-bait. We have been doing that all day but Daniel and Mitch just not lucky enough to get one Toman or Giant Snakehead on the leader board. Mitch got one strike, but the line was line was too thin and it snapped right after impact. It is not as easy as it seems. They are fierce predators and a badass looking fish. They area quite shy and very very opportunist. So the final day was a slow day and we ended the day early as we don’t want to be in Penang quite late. Overall it was a great experience for me and hopefully for Daniel and Mitch. Who came all the way with us to experience Royal Belum and Kampung Beng. Before we head home, both of them were blessed to be able to witness an Asian elephant out here in the wild. It gave us some good show, ripping bamboos like tooth pick. A moment that will be remembered for the rest of our lives. It was a short 2 hour drive back to Penang. We bid farewell and hopefully you guys will be back next year as we still have unfinished business here in Royal Belum. Thank you again for being with us and stay tuned for more update on Fishyology. Mitch and one of our final Sebarau of the trip. 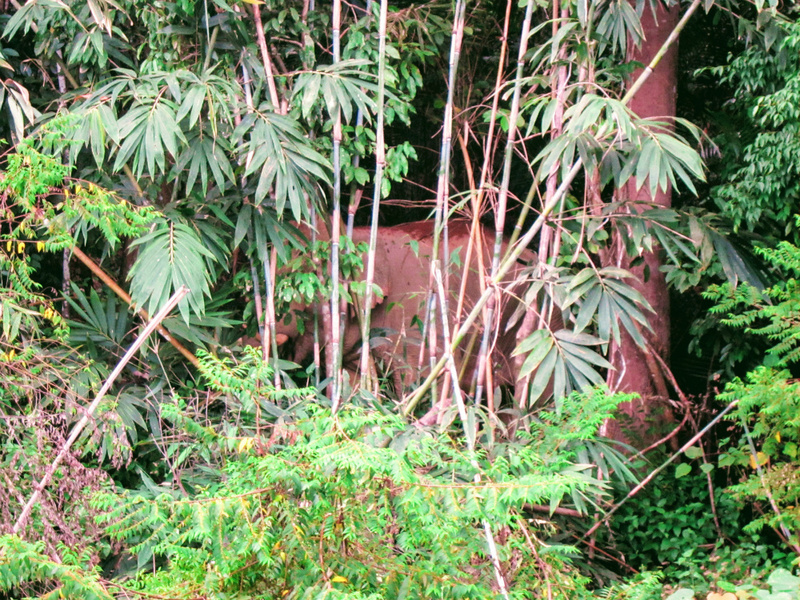 Hidden behind the Royal Belum Jungle, A male elephant chewing Bamboo for lunch.